April 2, 2019 – In launching Vendor Surf, we could have simply made the needle much larger and easier to find, but we thought it best to just burn the whole damn haystack down and remove all struggle! You no longer need to spend days or weeks conducting due diligence in search of viable vendor partners. You now just need minutes, literally. 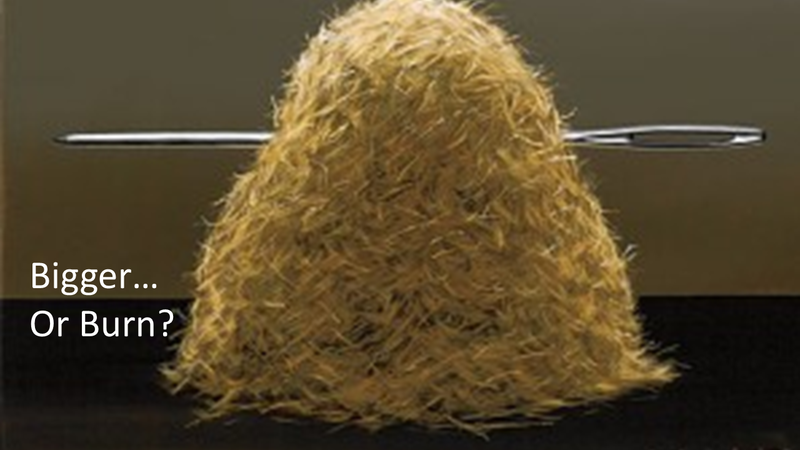 When I ran Global Vendor Management at the 4th largest mortgage lender, a 'needle in a haystack' was what it felt like when some executive would call and say, "Roller, I need a new vendor in 15-days when we will drop 40,000 mail pieces." Of course, my reply was always, "What the Hell (WTH), do you think I am Houdini?" (Well, maybe just a silent thought coursing thru my brain anyway, as I did need a paycheck.). There were not any good options to efficiently know what vendors existed, or whether or not they could meet my unique sourcing needs. I hit a few directories, but mostly started calling industry friends to see if any had used a similar kind of vendor and whether or not they were worth considering. It was the fastest way. The point being, business moves much faster than reality and reasonableness want to allow. We are constantly thrown these impossible tasks. This is almost always the case for those of you sourcing vendors. And, there is just way too much at stake to shortcut the process. Choosing poorly has devastating consequences. We recognized the industry needed sourcing tools that actually matched the level of effort and criticality in vendor sourcing. Phoning a friend just didn't cut it. In building Vendor Surf, the first and original vendor search engine for mortgage and credit union ecosystems, we specifically set out to help solve those 'WTH moments' by making the vendor due diligence process SIMPLE and with IMMEDIATE results. Proudly, you will find nothing else out there like our search engine. For six years our 3W Partners business had continually served the industry as a human 'Match.com' resource, always helping make vendor introductions to financial institutions in need of a product, service or technology. Then one day in late December 2016, during a strategy session at the local brew pub (yep, self-employment suits me fine), Craig and I noticed how almost every single TV commercial was for a search engine... the 'matchmaking concept' we had just spent an hour discussing, and how to blow it up much bigger. The seed was planted. Directories have long-existed, but search engines are new to our domain. We are sometimes asked the difference between the two. They are polar extremes. DIRECTORY – Here's the deal. There are some great entities out there with directories, buyers guides and black books, but, the truth is... they are archaic, inefficient and time-consuming. A place to .START your research, with a huge time commitment required to comb thru each company's website to mine the little nuggets. SEARCH ENGINE – A place to .COMPLETE your research, with immediate on-screen results... throttled only by how fast you choose the specific filters that suit your sourcing needs. Identifying exactly who meets your needs. Instant results on Vendor Surf. I don't want to go back and reflect on my days relying upon directories or generic Google searches. Painful memories.